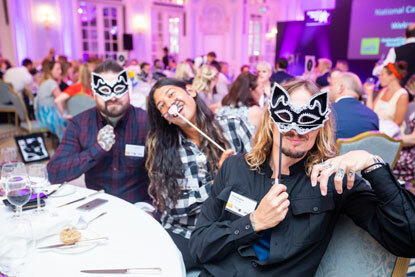 With glitter liberally sprinkled on tables, and cat masks at the ready for purrfect photo opportunities, the glamorous 2018 National Cat Awards got underway at The Savoy hotel in London on Thursday 2 August. It was a truly heart-warming event for all of the fabulous feline fans in attendance, as well as for those watching at home with their moggies via our Facebook Live stream. 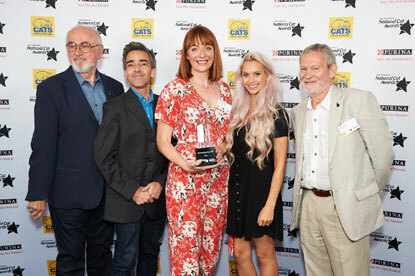 There was a great deal of media buzz with several celebrity cat lovers there to present the awards, but it was the finalists themselves who were the true stars of the show. Our Master of Ceremonies Alan Dedicoat was back to oversee proceedings, delighting everyone with his instantly recognisable voice as the official Strictly Come Dancing announcer. In fact, the event was something of a Strictly reunion…. Winner of the Furr-ever Friends Award (Salem) Jared Bignold and his mother Verity with and Justin Hawkins. Credit: Cats Protection. Musician and first-time judge Justin presented the Furr-ever Friends award and told the story of how Cats Protection helped reunite him with his cat Cully who went missing for three years, all thanks to her microchip! He also added that he didn’t know what to expect from the ceremony, joking that he worried it might just be ‘a handful of people with hair on their clothes and a slight smell of urine’! 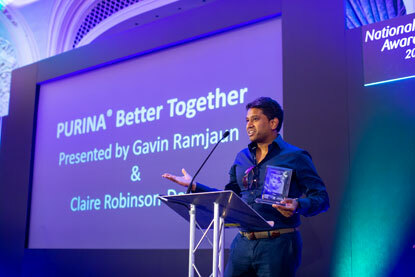 News presenter Gavin sparked a gasp in the room with this confession while presenting the Purina Better Together award, but Alan jumped to his aid by saying “To be fair, he didn’t say he had a dog!” Gavin then went on to champion Cats Protection’s Paws Protect service, which provides temporary foster care for cats whose owners are fleeing domestic abuse. 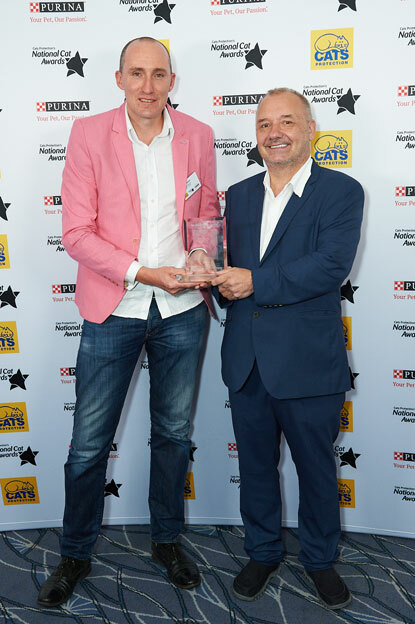 Comedian Bob was there to present the Outstanding Rescue Cat award and reflected on his recent visit to Cats Protection’s National Cat Adoption Centre in Sussex. He even urged the audience to go and spend a day at their local Cats Protection centre because it’s an ‘incredible experience’. Bob also added that his own cats, Goodmonson and Mavis, had insisted he attend the awards on their behalf. 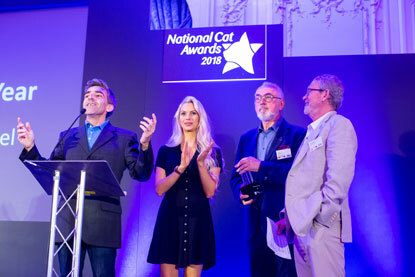 Author and broadcaster Andrew Collins was thrilled to be attending his third National Cat Awards and joined actors Paul Copley, Peter Egan and Jessica-Jane Stafford on stage to announce the winner of National Cat of the Year. He also declared his love for monochrome moggies, saying: “Once you love a black cat, you love a black cat forever” and encouraged the crowd to get #BlackCatsMatter trending on Twitter. 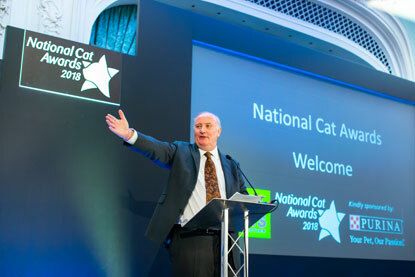 Downton Abbey star Peter Egan had these beautiful words to say as he joined his fellow National Cat of the Year judges on stage, prompting rousing applause from everyone in the grand ballroom. Then it was the moment everyone had been waiting for…the winner of National Cat of The Year! 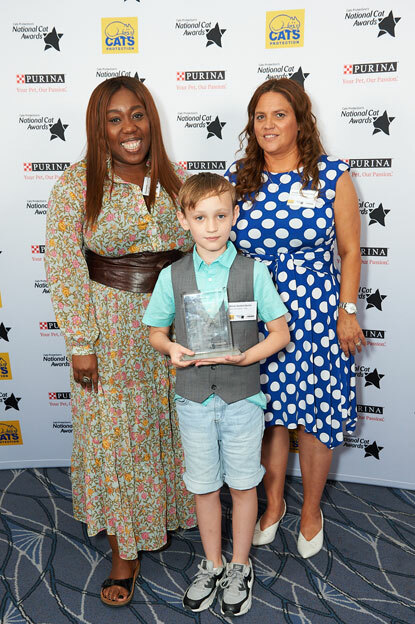 There wasn’t a dry eye in the room when Theo was announced as the overall winner of the awards. This plucky puss had survived cat flu thanks to his caring owner Charlotte and a few years later returned the favour by potentially saving her life when she developed a blood clot. 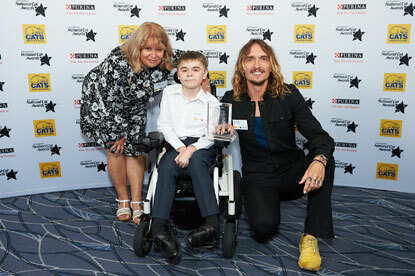 Tragically, Theo died just a week before the awards, after the winners had been decided, but according to his owner Charlotte this has made his win all the more poignant. 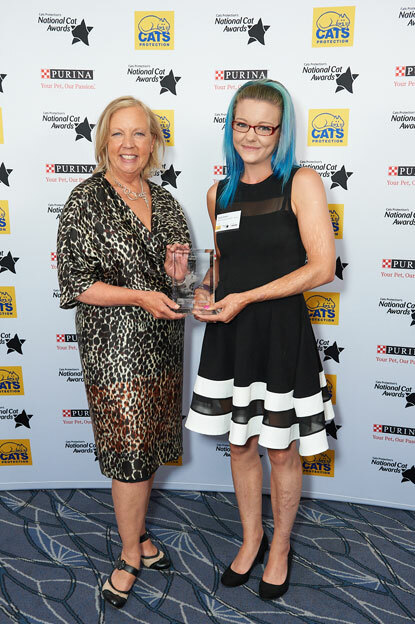 Find out more about the 2018 National Cat Awards at www.cats.org.uk/nca and don’t forget to search for #NationalCatAwards on Facebook, Twitter and Instagram to see all those purrfect pics! Can you give one of these long-stay cats a home? I’m walking 600 miles for cats!